The University of Maine at Presque Isle will mark the 20th anniversary of a campus building that has served as a major hub for student activities, community events, and cultural programs in the region by hosting its Campus Center 20th Celebration, to be held on Thursday, Oct. 25 from 4-6 p.m. The campus and community are invited to attend this free event. This open house event will include guided building tours, live music provided by local artists, giveaways, door prizes, and an appetizer showcase by ARAMARK. In addition, the UMPI Bookstore will offer a 20 percent discount on selected merchandise. Guests visiting campus are eligible for a Grand Prize of discounted catering and facilities. The Campus Center, which opened its doors in October 1992, was originally conceived as a student center with a variety of spaces to host many different types of activities, from meetings and workshops to banquets and other social gatherings. 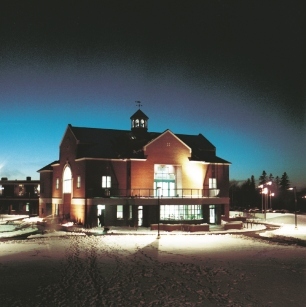 Over the years, thousands of people have utilized the facility; it has become a central location for student events, cultural activities, and state and regional meetings and conferences, and it is home to the Owl’s Nest, the Reed Fine Art Gallery, the Student Senate office, a University Credit Union branch, the Campus Communications Center, the UMPI Bookstore, a local day care center, and the campus’ dining facilities. The Campus Center was built with funding from three main sources: through donations from community members and businesses, through a bond issue, and through a yearly student fee. It was connected seamlessly to the existing campus building Kelley Commons, which was built in 1967 and dedicated to the first matron of the school, Miss Mary E. Kelley. Kelley Commons houses the large, and recently redesigned, dining hall located on the second floor, which can seat up to 300 people at a time. For more information or to RSVP, please contact Mary Lawrence at 768-9502 or mary.l.lawrence@maine.edu.